When creating your dream backyard it is important to think of functional versus ornamental. Many backyards may look stunning but may not be suitable for your lifestyle. This is why when it comes to backyard landscaping many Australians opt for pergolas. From traditional, modern or even federation style homes there is are pergola designs to suit all houses and lifestyles. Pergolas provide a practical and functional outdoor living area, allowing protection from those scorching summer days. Based in Melbourne, Everlast Services battle all four seasons in one day, which is why our neighbours, and their neighbours all have pergolas. These structures allow homeowners to enjoy their backyards all year round no matter what the weather throws at you. It is important when thinking about making a structural impact on your yard, to first consult and get approval from your local council. It is also vital to consider a variety of design features and ‘structure musts’ with your pergola. Homeowners who want to achieve more of an ornamental feel often choose freestanding pergolas. These are frequently treated timber structures where vines or plants are encouraged to grow around and over the open, timber-beamed roof. These stunning pergola’s can allow a little ‘quiet space’ in that ‘dead’ corner of your yard. The backdoor to your home often opens up into this particular pergola creating this outdoor room feel. The roof of the main house and the pergola are most likely attached or overlapped providing full protection from the weather. These are the most common pergolas creating an alfresco living environment and they brighten up a dull backyard. 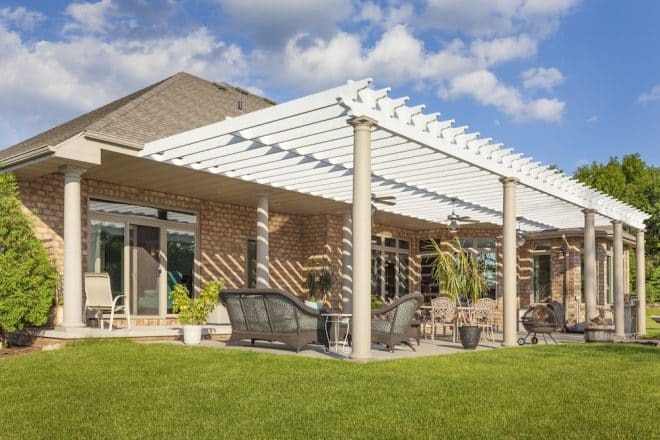 Providing shade over an existing patio or just creating a usable outdoor space is an excellent reason to choose an attached pergola. This classic Aussie pergola delivers constant weather protection, allowing you to have all year round barbecues. The first documented pergola was in Rome, which dated back to the 1600’s. Back then a pergola was an important garden feature often built over walk ways with plants climbing over the top, creating a natural shade. However, today there are many reason to opt for a pergola and you have a huge variety of materials you can chose from. This is the great thing about pergola designs; depending on what you want from your pergola you can pick a material that is suitable for you. When choosing your structural material it is important to think of wear and tear, as well as, the look you are trying to achieve. Treated timber is the least expensive option when building a pergola and there is always a large range of timbers to choose from. This will allow you to pick a design that best suits your home. Remember if choosing a timber each one will be different when defending your structure against things like termites and weather. If maintained and cared for correctly, a treated timber pergola will last a reasonably long time. For a pergola project almost any timber (hardwood or softwood) can be used, however it is important that if you want a durable and long lasting structure to buy treated timber. Many Australians decide to pick native timber because of the natural look it provides and the availability and cost factors. Grey Ironbark – Premium hardwood and native to Australia providing a hard, strong and durable outdoor structure. Colour varies, ranging from a redish tint to darkbrown. *According to Australian Standards when building an outdoor (above ground level) structure timber should be treated to H3 (or higher) to minimise decay, borers and termites. Outdoor and in-ground timber subject to severe wetting and leaching should be treated to at least H4. Whilst a steel or metal pergola will most likely set you back more then the treated timber option it is definitely important to consider. A steel structure will last longer and have a lot less maintenance then timber. Steel provides more strength and durability when it comes to things like weather, and also comes in a variety of colours and styles. It takes paint very easily and can also reduce the chance of it catching alight in an event of a bushfire. Due to the strength that steel provides it can also allow for unusual and different structures. If you have an unusual shaped space, steel is certainty something to consider to get around an unruly bend. When thinking about the materials of your pergola it is important to also consider your roofing options. Today with both modern and old-fashioned materials readily available it is up to the homeowner to decide. When picking your roofing material it is again important to consider what you want your pergola for. If you want to use your pergola all year round it is important to have an enclosed roof to provide protection from the weather. This will allow you to enjoy and use your outdoor space more. However some polycarbonate roofs are noisy when it rains, it can also create a sauna like space on those hot summer days. If your pergola is simply a garden accent use a high durable and long lasting wood so the climbing plants don’t suffocate the structure. There are a lot of things to consider when building a pergola, whatever your reason Everlast Services is here to help. Call us now for all the advice you need from the experts that understand your pergola is different from your neighbours.